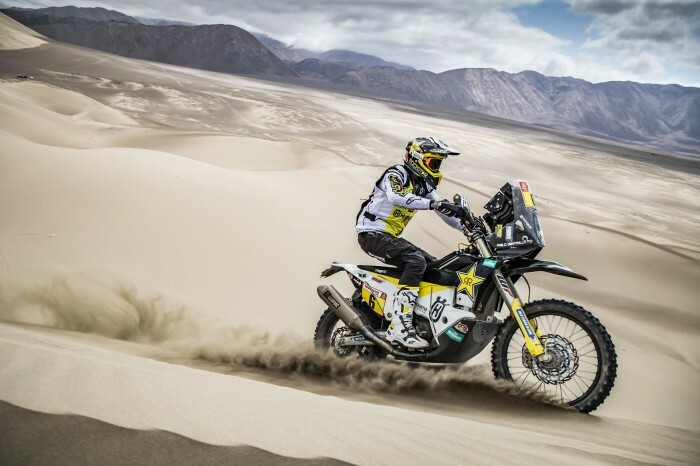 Rockstar Husqvarna’s Pablo Quintanilla re-took the overall 2019 Dakar lead with his first individual stage victory on day six. The Chilean got involved in a battle for the stage victory with fellow South American Kevin Benavides, Quintanilla took the virtual lead before the penultimate waypoint and never looked back. Following a well-considered plan of attack, the FR 450 Rally mounted Quintanilla has put himself back into the rally’s overall lead with four crucial stages still to be contested in the Peruvian countryside. Overall, he is now four minutes and 38 seconds ahead of his closest rival. “Everything went according to plan today and I’m happy with the stage win. The day wasn’t easy, the pace was quite fast, and navigation was difficult. We also had to race through strong headwinds,” said Quintanilla. “We had a good battle with Kevin Benavides and at one point I managed to pass him and retain the lead. It’s good to be back on top in the overall. The race is still long and I want to stick to my plan.